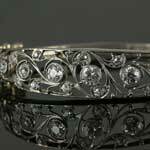 Exquisite antique diamond bangle bracelet in yellow and white gold (1.60 ct tw). 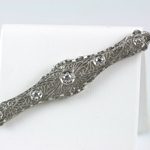 Captivating. 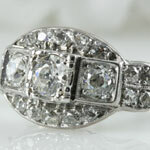 Bright light disperses in every direction from old cut diamonds in this exquisite antique diamond cocktail platinum ring (1.29ct tw). 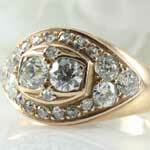 Over 1 3/4 carats of white old European diamonds shine in this gorgeous antique yellow gold wedding ring (1.88 ct tw F-H). 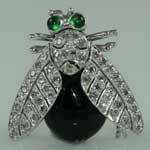 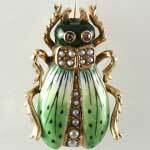 This antique diamond black onyx insect pin has movable wings and legs. 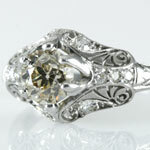 Fifty-one fiery diamonds create a stunning antique diamond engagement ring or right hand dome dinner ring in platinum (1.28 ct tw, VS1-VS2). 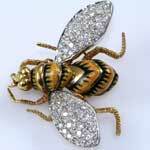 A magnificent estate enamel black and gold wasp brooch with two wings of white diamonds (3.05 cttw, VS2 - SI1, G-H). 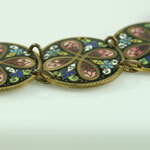 A rare antique big enamel necklace or belt. 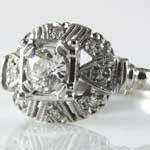 Incredible antique estate old diamond filigree engagement ring in platinum (1.04ct tw). 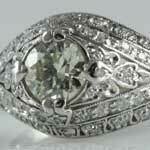 SOLD Magical ladies antique 1/2 carat diamond wedding ring in 14kt white gold (0.66 ct tw, 1/2 center diamond SI1, J). 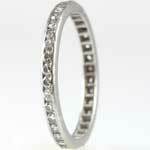 Antique eternity diamond anniversary wedding band in platinum (036 ct tw).